We had a great time at our annual team Christmas party! Click here to view the photo album for this event. We had our annual team fundraiser at the Comedy Nest, organized by captain Jimmy Chan! A huge thanks to the comedians for their great performances, and a big thanks to everyone who showed up to support us! We had an awesome night at Wok Cafe for our annual team dinner, to celebrate another successful dragon boat season! 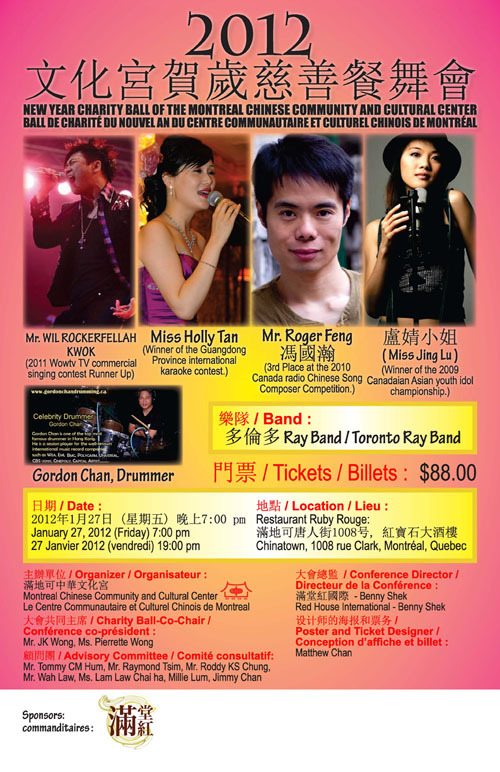 New Year Charity Ball of the Montreal Chinese Community and Cultural Center. The event included an 8-course meal and a show performed by various singers from around the country. Some of our Phoenix Warriors team members as well as from other teams like Maki Catta, came to volunteer and help out. Some of them performed lion dance and dragon dance, and some of them worked as hostesses, bringing guests to their tables. Many government officials and representatives attended the event in support of the fundraising. It was a very successful event! We had a very successful fundraiser at the Comedy Nest. A big thanks to all our supporters! He works with me in the same company, during our MIDRRF Montreal Dragon Boat Festival this year, he and his family came and cheered on us, he is one of our fan for years, he always wanted to experience to participate in dragon boating, but he has a health problem, I have been helping him in fitness training the past years. This year, after he came to cheer on our team at the Montreal festival big race, on the same week during his vacation, he had a stroke, his heart stopped while he was sleeping, actually his heart stopped more than two times, but it wasn’t his time yet. And now he has a pacer next to his heart to keep him in good health, he said, GOD sent him back, he sent him back to be with our team Phoenix Warriors, he came to me, and he has made a commitment to himself to train hard to run the marathon next summer, to prove that he is OK ! I was really touched when he told me, and asked me to be his trainer as to be his supporter, to give him more motivation. Tonight, it will be a special moment for him, for everyone in our team to come together like a big family to witness his new journey, and for that, I will be presenting him my own GOLD medal that we won at the men competition this year to him for his courage and spirit as a fighter, that he is running for his life. We had our annual team celebration dinner at Wok Cafe! We had our annual early Christmas team dinner party to celebrate a successful season. It was a great success; they came home with 3 medals (1 bronze 3rd place in the world at the 2000 meter race, 1 bronze 3rd place in 500 meter race, and 1 Silver 2nd place at the 200 meter race). Click here to view the photos for this event! MIDBRF was invited again to compete in Shanghai. 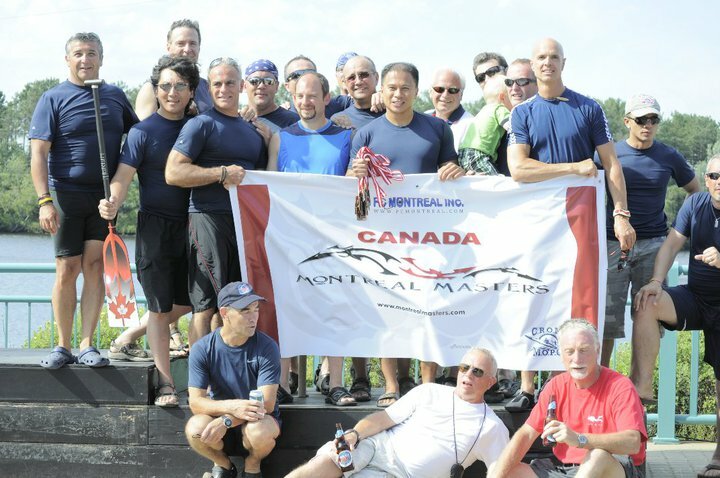 A special team was formed (Montreal Dragons), which consisted of several paddlers from different teams, including some of our own team members: Jimmy Chan, Tao Tao, Edward Henderson, Ran Tao, Matthew Chan, Benjamin Roy, and Robert Wong. Besides having a great success in the Shanghai competition, the team also had the chance to visit the Expo. The Montreal International Dragon Boat Race Festival was invited to compete in Shanghai. A special team was put together (Montreal Dragon Boat Team) to represent the city and the festival, and our team members, Jimmy Chan, Matthew Chan, and Kane Chan, were chosen to be part of this team. During their visit, they also visited Beijing and Hong Kong. After coming back from Shanghai, the team was invited to City Hall to sign the Golden Book.